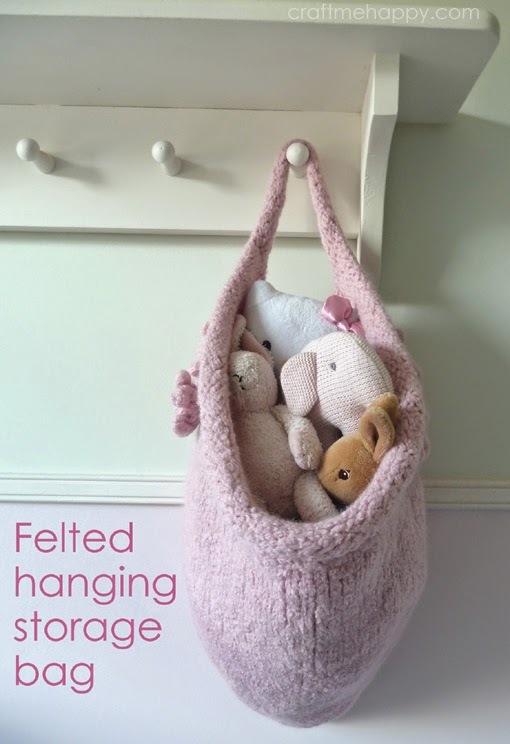 I've had a few enquiries asking for the pattern for my felted toy storage bag that I posted about several weeks ago. Thank you everybody for your interest. I'm so sorry I haven't got around to sending the pattern on or posting it to Ravelry yet. Firstly I wanted to change the shape a little as I'm not totally happy with it, but also to offer a variation. As the bag is made from hand spun yarn I need to find out what gauge my yarn spins up to so that I can suggest alternative yarns. I thought I'd illustrate my process here as it's not something I've done for quite some time. This is proving rather tricky as it isn't conclusively one gauge or another. The problem is that there are a few methods for determining the gauge of a yarn and they all give me varying results and none of them are conclusive. My yarn is spun with 3 plys and I originally suspected that it fell somewhere around the aran/chunky/super chunky yarn weight so this gave me a starting point. 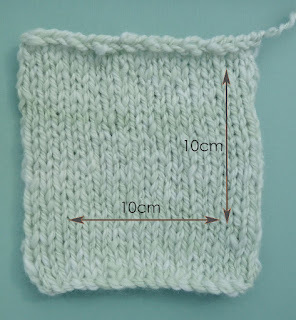 I believe that the most important method of measuring a yarn is the gauge it knits up to; after all, your metres per 100g is irrelevant if the yarn doesn't knit up to the right dimension. I knitted a swatch in stocking stitch using 8mm needles. 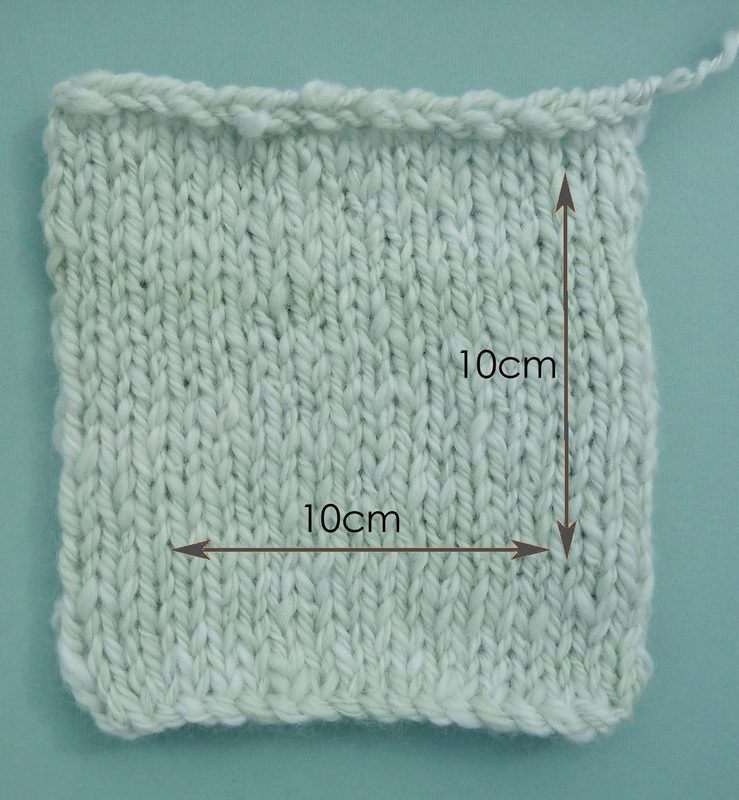 I cast on 20 stitches and worked 23 rows - this gave me a square that was far bigger than 10cm x 10cm, but I always like to measure from the middle of a swatch to get a more accurate result. 10cm x 10cm worked out at 12.25st x 16 rows therefore, using this method it is slightly heavier than a chunky (US bulky) yarn and just inside the minimum limit to be classed as a super chunky (US bulky). Next I thought I'd try the WPI method which involves wrapping the yarn around a ruler or pencil and then measuring how many wraps it takes to span an inch across. I was getting 7 or 8 wraps per inch and so using this method, according to Ravelry my yarn would be either aran weight or chunky (US bulky.) That was no help! So finally I thought I'd try to find out how many metres are in 100g. This was the most laborious of all and possibly the least accurate - I see no need to to do this again! I measured off 69 metres from my bobbin which weighed 78g. Therefore that would give me 94.5metres/100g. According to this useful chart on wikipedia that falls just inside a super chunky (US super bulky) yarn. However, despite 2 of the results coming out as bordering on super chunky I'm really not comfortably classifying my yarn as super chunky or super bulky. I've seen super chunky yarns and they're much thicker than my yarn, so I think I need to nail it it down to finding an alternative yarn that knits up to the same dimensions. Having searched through the yarns on Ravelry that will felt, and comparing the stitches per 10cm I would conclude that my yarn is only slightly heavier than the Wool of the Andes, bulky weight. Apparently this yarn felts beautifully as it is not Superwash wool. This may well shrink down smaller than my felted bag though. If you wanted to guarantee a bag that is bigger than mine, then you might want to opt for a super chunky or super bulky yarn that is 100% wool without a Superwash finish. - but it will be bigger than my bag; by how much, I have no idea... Maybe that is my next project!